Apple has added another "revolutionary" feature to iOS6. The ability to upload from the phone via a web form. Never mind that other mobile browsers have done it out of the box for years. Never mind that Apple was railing against Flash and eventually killed it for not being standards compliant, but then forced website owners into app development or email upload systems. Don't get too excited - Apple still only allow uploading files from the camera roll.. So if it's not a video or a photo in your camera roll, it's not going to be uploadable. Now, full disclosure, I have a Samsung Galaxy Nexus handset. It's running a Google supplied Android Jellybean 4.1.1 image with the exception that I've unlocked the bootloader and injected the "Superuser" package to give me full admin privileges as and when I require. Out of the box, fresh from the store, the Galaxy Nexus does NOT have a file browser and therefore, similar to iOS6 does not allow upload from anything outside of the "Gallery". 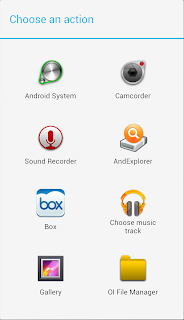 Installing a freely available app from the Google Play store (such as OI File Manager or AndExplorer), however, adds in options quickly and easily, such that when you go to upload from the browser, you now have the ability to say "Actually, rather than browsing the Gallery, I'd like to pick a file from my files on the device". Whilst Apple say there's no file system, applications can store things in their own "Documents" folder, so arguably, like Android, there's room for them to allow applications to register a way of exposing their files to one another for access. This, however, goes against Apple's trend of silos. Files? What files? It's all *waves wand, makes woo woo noises* "in the cloud" - which is all well and good, until you want to move something from one cloud service to another, right there and then, on the go. Being able to share a weblink from one app to another app is not sharing the content - it's securing the content in the given cloud platform and dragging people there! Apple doesn't want you moving stuff between services - they want you to store everything in iCloud. This recent move by Apple to allow file uploads reminds me of the whole MMS debacle. Apple decided, in their wisdom, when first releasing the iPhone that MMS (sending content via an SMS like mechanism) was a dead technology and that they'd only support SMS. Apple was pushing email as the way forward - but not all phones do email. Third party app developers worked on hacks, people complained and complained.. and then they added it, to much fanfare.. as if it was a radical feature!? This, I believe, demonstrates the need for Apple to have competitors to keep it in check. Apple, and indeed its late co-founder, swear that Android is a clone platform, an iOS knockoff. I would argue that iOS and Android are fundamentally different, but that both benefit from having the other in the marketplace... for giving users choice. The state of intellectual property laws as they are today, primarily thanks to the United States and things like its Mickey Mouse approach are killing innovation. Where, otherwise, technology is moving at a rapid pace, things like increasing copyright terms and broadening of what can be patented are stifling it. I'd argue that inventors and developers need to be rewarded for their work, but given the pace of innovation, the duration of the term for which the works are protected needs to be reconsidered - and growth of these terms certainly halted. That's my rant for today - what do you think?